As my childhood habit of walking around with a briefcase clearly indicated, my career path was assumed from the beginning. My high school job at a law firm, political science degree from UConn and admission into law school only solidified my determination. Well, surprise, surprise. A brain tumor, a few failed attempts at the bar exam and a new-found interest in fundraising later, I found myself walking out of the law firm I worked at since I was 16 for the last time. For my readers who do not already know, I recently joined the United Way as a partnership manager in development. I am grateful to my former employer for taking a chance on me as a junior in high school and grooming me to succeed in anything I set my mind to. Through my ups and downs and all of the trials and tribulations, they supported and encouraged me. Who knows though, maybe it was meant to be? During my first few weeks at the United Way, a lady stopped by and after her second visit, left me literally speechless. She was not there to give me business or build upon a relationship though; her red and black outfit gave her away, my ladybug was back. Her first appearance was when my office neighbor walked in and showed me who flew onto her hand – not even knowing my story or the connection. The next week, there she was again, perfectly propped on the wall. Immediately, any second thoughts melted away and I knew that this was a sign that I had made the correct move for my career. Prior to accepting this position, I knew that a career change was necessary and would allow me to fulfill my purpose in life. But giving up something that I had worked so hard for and that this story is so connected to was difficult. Yet, her presence in the office gave me the assurance I needed. The change from the private sector to the nonprofit world has been difficult at times and the road to mastering the skill set I need to succeed will be long and challenging. However, I am eager to make a philanthropic impact on my community and to simultaneously fine-tune my ability to have a personal impact on the brain tumor community to help all the doctors, researchers and nurses who care for patients. I have not had the opportunity to meet with the department Chair or the resident overseeing the study on central neurocytoma at Yale, but am eager and excited to see what they have learned. I am humbled that in 2018, ten years after my diagnosis, a study will be published and a resource available for the next patient diagnosed with this very rare tumor. 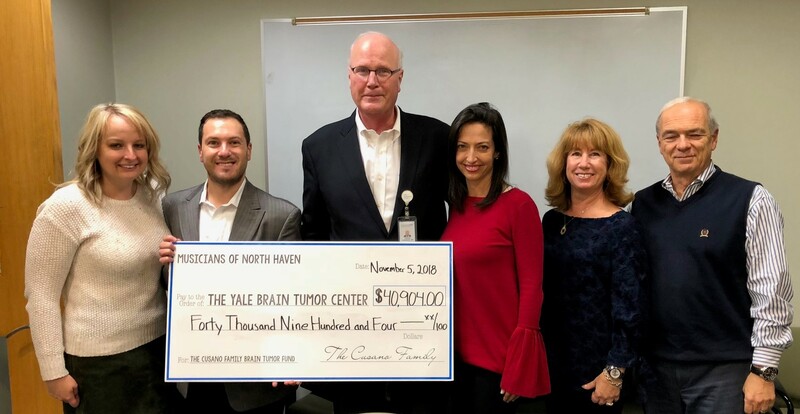 Through the Cusano Family Brain Tumor Fund and through the many donations received from my readers, we are funding this important research study and collecting samples from another major university. Back when I was diagnosed, there was not an abundance of information on this rare tumor. Gratefully, we are on the brink of making this a reality. My passion and pursuit to help those in need will not stop here though. I trust that the skills I develop in my new position will allow me to make a greater impact and give hope for anyone diagnosed or who is facing this dreaded diagnosis. Everything happens for a reason and I am content with where I am. Though it took me nine years to come to this realization, I understand and believe that I am not an attorney for a reason and that I got sick so that I can help people. More than anything though, I thank the ladybug for making her appearances and assuring me that this was the right move and for her continued presence in my life. Another fun Cusano family vacation to Nantucket is in the books! Whether it was on the beach, out walking around town, paddle boarding (yes, I did it!) or at Cisco Brewery, I was happy and carefree. It is great to just wake up with no pressures – no phone calls or emails to respond to, no meetings to attend. I definitely need to reward myself and take advantage of the time that I am afforded to do this more often. However, I’d be lying if I did not acknowledge the moments where my mind wandered and I caught myself thinking about the past and the adversity I have overcome to get here. It wasn’t feelings of sadness or depression, but rather, joy and jubilance. If you had told me back in 2008 I would be riding a paddle board in the ocean, traversing through massive yachts, I would have told you that you were nuts. For the past nine years, nothing has been perfect – be it law school, the bar exam, seizures, weakness or more surgeries. Yet, this week was an exception. All of this made me realize that everything in life is in flux and nothing is permanent. I watched the waves rush in and then wash out. Ferries dropped people off and then came back to pick people up to bring them home. As I sat on the ferry home, I realized that nothing is constant – we cannot bottle up good times and moments to take them home, but we can certainly savor them. I said it earlier, and I’m saying it again – nothing in life is permanent. While this may sound negative, it is not because it is reality. Just like life on the island, everything comes and goes. The good, the bad, you have to just keep paddling. As I learned at an early age, life is short and should not be taken for granted, so live it up. After 9 years of making adjustments and coping with bad news that seemed as though it would never end, today, I am victorious. I spent the morning at Yale for an MRI. 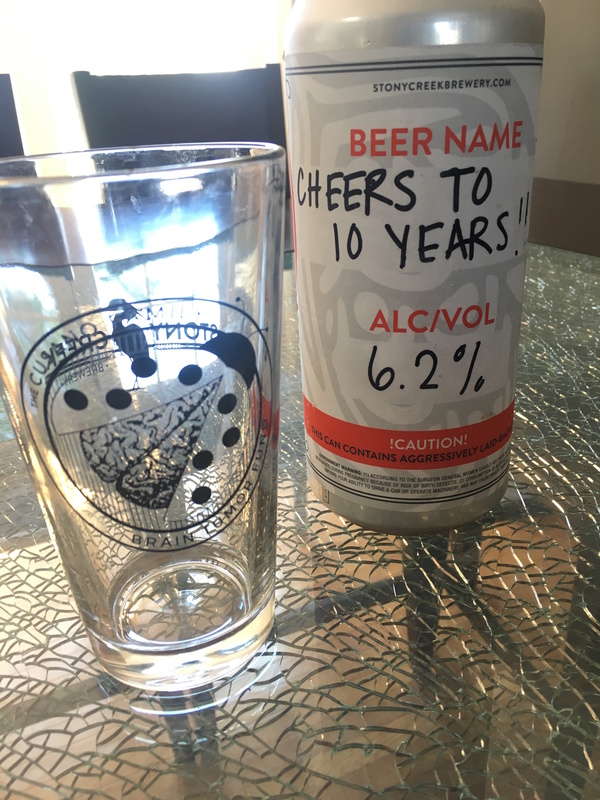 As I laid in the noisy tube, I reflected on the past nine years and thought about what my life would be like if the scan was clear and the tumor truly was gone for good. For nearly one-third of my life, I have made trips to Yale for surgeries, appointments, having staples removed, and MRI’s that ranged from 3 months to one year. Going in today, and as I laid there humming to the tapping noises emanating from the machine, I knew there was the distinct possibility that this life experience could be a thing of the past after my appointment with my doctor. But I take nothing for granted these days, including Ashley, my best friend and the one who has been there with me every step of the day since day one, when I called her after receiving this horrifying diagnosis. “Your brain looks pristine! Everything looks great!” He was pretty confident after the last scan that this would be the case and reminded me that he was pretty aggressive during the last surgery, so he was not entirely surprised. I thought I was dreaming, albeit a happy dream. Logically, the question “What should our plan be going forward?” was presented. After a brief discussion, it was decided that I do not need another MRI for 2 YEARS. Yes, you read that correctly! If I ever need anything though, I’ll know where to find him. to bear alone, but that of my family as well – and without all of their support, I would not be here, writing to you. They have played such an instrumental part in my recovery and never once stopped believing in me, nor allowed me to give up on myself or dreams. I look forward to many more years of health and sharing my stories of hope, courage and inspiration with each of you. Time and time again, we hear “your health is all you have in life and without it, you’re nothing.” If you’re like me, you immediately think of your physical health. Yet, perhaps often overlooked is the other side – a person’s psychological health. The emphasis is rarely placed on mental well being, unfortunately. Psychological ailments are typically met with criticism and stigmatization. For fear of being labeled “crazy”, mental illness is hidden and pushed aside. 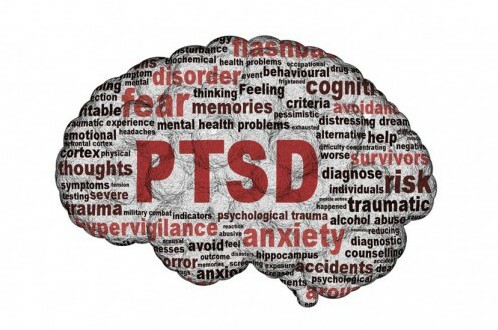 According to the most recent National Institute of Mental Health survey, 18.6% of the United States population is currently suffering from a mental, behavioral or emotional disorder. Let us not forget that this number is likely skewed – how many people are truly admitting to experiencing a psychological disorder on a survey? The prevalence of psychological disorders is staggering. Ashley earned her bachelor’s degree in psychology so she continuously nags me about some psychological condition which she has claimed I have had since my first craniotomy. The simple fact is that any surgery can be a traumatic experience. In her view, and the view with which I now share, major brain surgery at 24 years old, followed by a near deadly infection, followed by months of rehabilitation with the cognitive ability of a 2nd grader due to hydrocephalus, radiation and then a recurrence has definitely caused me trauma. Yes, I survived. Yes, I am tumor free, or at least I hope. I have my health and life. But as Ashley has reminded me over and over, I have never given myself a minute to mourn my loss. And contrary to what I say (the ever-stubborn man response of “I’m fine”), perhaps there was a true loss. In the span of less than 24 hours in 2008, I had an MRI, received the devastating news that I had a large tumor in my brain and was brought in for emergency surgery. When my initial surgery and physical recovery was over, I immediately went back to work and then school. There was no opportunity to process the news and mourn. Ever since, I have spent the last 7 years of my life with a brain tumor on the back of his mind (no pun intended). I lost the carefree days of my twenties. I lost the ability to complete law school with my peers and to pass the bar exam. I take 3,000 milligrams of medicine per day to prevent seizures and face constant medical bills with rising costs in health insurance. I’m only 31. So while I am a happy and self-proclaimed blessed person, Ashley refuses to let me tell her “I’m fine” because as she tells me, she sure as hell would not be. Yeah, I’ve had my hardships and have successfully dealt with them one by one, but when I put myself in her shoes, I can understand where she’s coming from. She has witnessed the heartbreak when I didn’t find my name on the list of successful applicants on the bar exam list three times, the frustration in my eyes when I forget something I should not have and the aggravation that I grow fatigued easier now than I ever did before. She has begged me to go and speak with a trained professional or support group to truly open up and express my feelings. Those who know me, you know that I am stubborn and have not done so – at least not yet. I credit my stubbornness for one good thing though, and that is beating my brain tumor. Ashley has always maintained that I can talk to her about it if and when I am upset, but cautions me that I would benefit more from speaking with a trained professional or survivor’s group. She is unsure she can ever truly understand what I went through and the internal struggles I face. Whether she is right or not, I don’t know but I’m at least keeping the option open. My new work with the Connecticut Brain Tumor Alliance has helped, though – there is no doubt in my mind, or Ashley’s. She tells me she’s seen the way his eyes light up when I talk with other brain tumor survivors. And it’s true. While I love talking to her about everyday life, there is something special about talking with fellow brain tumor survivors for support and guidance. It is the best therapy. This week, I’m meeting with the Executive Director and a fellow brain tumor survivor to brainstorm about creating a patient-outreach platform where survivors can connect one-on-one with someone in need. When I woke up in the hospital at 24 years of age, I was lost. Just two months earlier, I had just completed my first year of law school and there I was, laying in a hospital bed trying to write my name and recite the alphabet. My family was by my side and I am forever grateful, but it also would have been comforting to have someone who could share some insight with me. I’ve come full circle – I have become the person that I needed seven years ago and hope I can now help someone else out there. Nobody should have to go through this experience alone. Everyone needs somebody to talk with and vent to, and I want to be that person. I’m not a medical expert, but I have lived through this and am confident that I can be a great resource for those who are in a similar position to that which I was in. I know it’s only a drop in the bucket, but I hope I can help level out the psychological versus physical health playing field. Well, here I go. Finally, twenty-two days removed from hearing that there has been a regrowth of the tumor and that an operation is necessary, I will be in surgery in less than 48 hours. While I have a myriad of emotions running through my mind, I am overall in good spirits and feeling extremely optimistic about the operation. I have the best team of doctors that someone in my position could possibly ask for and would not alter a thing. I have the BEST family anyone could ever ask for and am surrounded by a wonderful group of friends, coworkers and acquaintances. Nervous though? Sure; I’d be lying if I said I wasn’t. But I have faith. I have been told that there are a lot of people who are praying for me and I can feel the positive energy. But there is an additional motivating factor. This past week, the sports world mourned the death of ESPN anchor, Stuart Scott. Stuart passed away after a long battle with cancer but showed true strength and perseverance in the way that he fought. On July 16, 2014, Stuart accepted the Jimmy V Award for Perseverance and gave a speech which resonated with me and millions of other warriors: “You beat cancer by how you live, why you live, and in the manner in which you live.” Though I do not have cancer, that statement is spot on. A brain tumor, or any other disease for that matter, is no different. From day one of this battle, I have not allowed my tumor to get the best of me. Rather, I have stayed determined to battle back, punch for punch. After all, I know that so long as I remain optimistic and stare down this adversity which life continues to throw at me, I will persevere. The past six years have presented the darkest, most trying and most difficult of days but I will absolutely tell you that my tumor has taught me invaluable lessons about life and the way we should live. Every day is a miracle and nothing should be taken for granted. And with that, I’ll enjoy the next day with my head held high, confident that this is the close of this arduous journey in my young life. Keep those prayers and good vibes coming. Hey Pretty Lady Won’t You Give Me A Sign? The summer was moving right along and the days were creeping closer to my 2L year. The date was now August 15, 2008 – exactly one month after being sent home. Yet, at the recommendation of my neurosurgeon, I was sent back to Yale for neuropsychological testing. While I have never told anyone this before, the entire process of neuropsych testing was my lowest point. Law school exams had suddenly felt easy – the stakes now were far too high and I was terrified the entire day. And while I was unable to appreciate at that time the significance of what the testing meant, I somehow knew it was a major point in my recovery if I wanted to resume the life I knew and get back to school in a few weeks – because I was going back. Maybe I was naïve or I was just stubborn, but I somehow believed this was not just a fleeting thought. So, what is neuropsych testing? As defined by the Yale Medical Group, neuropsychology is a “clinical service that provides in-depth evaluations of various brain functions including attention, impulse control, problem solving, memory, language, visual perception, sensory-motor skills, intelligence and emotions.” The entire process is designed to test mental ability and I was being tested to see “where” I was on a cognitive scale. After the initial introductions and the ice broken, my parents got up and left me…alone….and helpless. I felt like a dog being left behind in a kennel – “please, no – don’t leave me here!” Well, I reasoned that the sooner he can examine me and I can get this over with, I can go home and daydream some more. I gathered myself for a moment, tried real hard to respond but could not get the words I was searching for out of my mouth. Once again, I felt like a complete failure. I loved the timed questions though. I recall one series where I was told a word and I was asked to provide a word that is similar. Yes, this is something you likely practiced in third grade, but today, my goal was to practice synonyms. During my lunch break that day, I was so distraught and upset with myself, and the person I had become. I called home and just cried to my family. The sound of concern in my parents’ voice was palpable and I instantly knew that their worst nightmare had come true – I was not doing well and the doctors’ fears were being confirmed. Nonetheless, being unable to be there and provide a smile and a pat on the back, they consoled me and encouraged me to go back in there and do my best, just as I had always done. And with that, I returned to the testing area for the remainder of the afternoon. But today – and possibly forever more – my best was not good enough. I later learned that after my phone call, my parents had a life-changing experience whereby they knew everything was going to be alright for me. Do you believe in fate, destiny, do you believe that things happen for a reason, do you pray when things get difficult, do you believe in God? I do. After we dropped Chris off, we could do nothing other then think about the testing and the latest chapter of his ordeal. The word aphasia was always whispered, and now the fear was that the diagnosis was going to be official. After Chris called that afternoon and cried through his lunch break, Karen and I became extremely emotional and sad and cried for him. At that moment, our son Stephen came home from his high school football workout and said he was starving. I composed myself and decided to light the gas grill and cook him some lunch. While cooking, I began to pray. I prayed for a miracle…I prayed that Chris would be okay…I prayed that God would give me this cross to bear and take it off of Chris’ shoulders…I prayed for a sign that he was going to be okay. Moments later, I heard a slight flutter in my right ear. Glancing to the right, I saw that a ladybug had landed on my shoulder and was just sitting there. If you believe like I do, she was my sign. That ladybug sat on my shoulder from 12:45 until I got into the car to pick up Chris at 3:30. As I got into the car I “released” her and as she flew off, I had an overwhelming feeling of confidence and peace. In my soul at that moment I knew he was going to be okay. Back to the testing room, as the sun began to set, the responses to the questions were not coming any easier to me and I was still struggling, if not performing worse. I had just let myself down when I had the opportunity to shine and prove everyone wrong. But I guess everyone else was right. 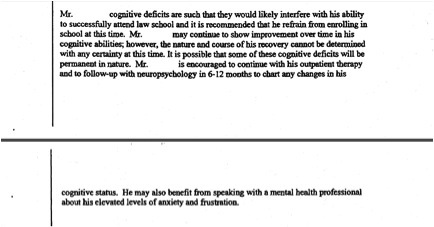 The report notes that “the nature of his language deficits (e.g. non-fluent spontaneous speech, word finding difficulties, poor confrontational naming, impaired oral and written expression) in the context of relatively preserved oral and written comprehension and intact sentence repetition abilities is consistent with the syndrome of a non-fluent, transcortical motor aphasia.” And there it was – everyone’s worst fears right on paper. Widely suspected but not confirmed until today, I had aphasia (a condition affecting brain injury and stroke patients’ ability to use or understand words). How would I get through this and where do I go from here? The ride home felt like an eternity and I had never felt so defeated before in my life. How did this all happen to me? …I was not going back to law school.